Noven Therapeutics Brisdelle™, packaged by PCI, is indicated for the treatment of moderate to severe vasomotor symptoms (VMS) associated with menopause. The Brisdelle™ compliance design features calendarized dosing for 30 days of therapy, with a designated area for the patient to note the starting date of the therapy. The Brisdelle™ package graphics highlight that the patient should take one capsule each day at bedtime. The calendarization of the product also highlights the need to refill the prescription in the final week of the packaged product. Package graphics also highlight the push and pull mechanism for accessing the child resistant protection for the package. The Prescribing Information and Medication Guide are conveniently located in the 5th panel of the package. Gralise is indicated for 24 hour pain control for patients with after-shingles pain, also known as postheraputic neuralgia or PHN. The Gralise Starter Pack is designed as a titration therapy, bringing patients from an initial dose of 300mg on day one, progressing to the maintenance dose of 1800mg by day thirty. Patients take a single 300mg tablet on day one, a 600mg tablet on day two, a combination of 300 and 600mg for days three through six, two 600mg tablets and a single 300mg tablet on days eleven through fourteen, and three 600mg tablets for days fifteen through thirty. The pack features extensive dosing instructions to help guide the patient through the dosing schedule. Patients are also encouraged to take Gralise with food, clearly identified on the pack labeling along with the opportunity to write the start date of the medication. 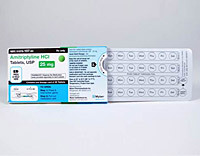 The multipanel wallet style card also includes a medication guide located in a convenient pocket. The corresponding prescribing insert is adhered to the back of the folded package. 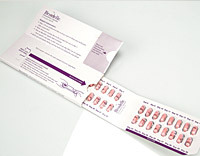 Shellpak® Renew with Optilock® technology is the smallest F=1 child-resistant adherence package on the market. It is designed to meet patient and pharmacist needs by enabling greater patient portability and improving pharmacy efficiency. The package features an advanced locking mechanism for the highest level of child resistance (F=1) in a significantly reduced package size. It is 23 percent smaller than the original Shellpak Renew, while still accommodating the same medications. Shellpak Renew with Optilock technology features a calendared blister and space for patient educational information, which is shown to improve patient adherence to medications. The decreased package size provides a more convenient way for patients to access and carry their medications, while also making dispensing medications quicker and easier for pharmacists. Mylan, one of the world’s leading generics and specialty pharmaceutical companies, was the first to package product in the new Shellpak Renew with Optilock technology, beginning in the summer of 2013. MWV’s innovative packaging solution is aligned with Mylan’s mission to meet unmet needs, by making prescription adherence more convenient for patients. Shellpak Renew with Optilock technology was designed using insights from both customers and consumers, and every element is optimized to be space well spent. The package’s outer carton is made of MWV’s Natralock®, a paperboard-based packaging solution that maximizes the use of recyclable materials and minimizes waste. The secure, tear-resistant carton does not require paper backing on the foil blister, making pill dispensing easy. In addition, the package contains enhanced adherence features, including a smooth-slide blister for easy medication access and color-coded spine labels to help distinguish among medications. The Mem.O.Ring is a visual reminder that takes the guesswork out of ‘when’ and ‘whether’ medication was taken. Medication adherence tools for eye drops are limited. There is no daily ‘Pill Minder’ for drops. Multiple medication regimens for post-surgery or chronic conditions can be confusing or overwhelming for patients wanting best medical outcomes. The patent pending Mem.O.Ring represents a 24 hour cycle which is reset each day to the first dosing time. Medication name is clearly identified on top band. 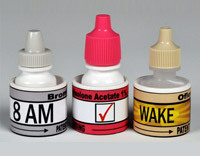 Color bands correlate with cap color to simplify drug identity. Dosing schedule is boldly identified with time, notated text or pictograms. 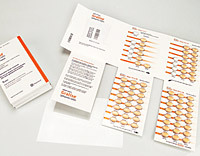 A die cut sleeve option may be positioned between the medication container and Ring to serve as indicator for next dosing and securing portability. 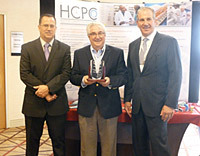 Mem.O.Ring offers benefit to Pharmaceutical Manufacturers as well. Medication name and manufacturer logo are clearly identified and reinforce patient association with improved outcome for long term customer loyalty. In addition to ophthalmic, the innovation has application for optic, nasal spray, inhaler and oral medications.